Watson gave the following information about his life and art to Native Peoples Magazine reporter, Diana F. Pardue. With his permission, we quote exerpts of that article..
"Watson Honanie learned to make jewelry in the summer months during high school. 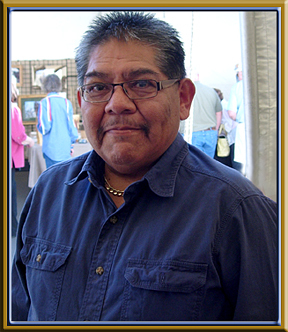 He would go to the Guild Shop at Second Mesa, on the Hopi Reservation, where his brother Phillip made jewelry. Watson helped his brother by doing tasks such as polishing the jewelry. He learned many of the basic techniques of silversmithing through observation during that time. Honanie's uncle, renowned artist Fred Kabotie, was managing the Guild Shop and would give Honanie scraps of silver that Honanie used to practice silversmithing techniques. Many of his designs are drived from clan symbols that appear as petroglyphs on canyon walls. Some - such as rain clouds, turtles and geometric water designs - are direct reference to rain. His hallmark is a hand in the shape of an open palm. Inside the hand is the friendship design that his brother, Phillip, uses as a hallmark. His wife, Sarah, and children Kara, Tiah and Shawn are a constant inspiration."